Azure Active Directory (Azure AD) Pass-through Authentication allows your users to sign in to both on-premises and cloud-based applications by using the same passwords. Pass-through Authentication signs users in by validating their passwords directly against on-premises Active Directory. If you are migrating from AD FS (or other federation technologies) to Pass-through Authentication, we highly recommend that you follow our detailed deployment guide published here. Ensure that the following prerequisites are in place. Create a cloud-only global administrator account on your Azure AD tenant. This way, you can manage the configuration of your tenant should your on-premises services fail or become unavailable. Learn about adding a cloud-only global administrator account. Completing this step is critical to ensure that you don't get locked out of your tenant. Add one or more custom domain names to your Azure AD tenant. Your users can sign in with one of these domain names. Identify a server running Windows Server 2012 R2 or later to run Azure AD Connect. If not enabled already, enable TLS 1.2 on the server. Add the server to the same Active Directory forest as the users whose passwords you need to validate. Install the latest version of Azure AD Connect on the server identified in the preceding step. If you already have Azure AD Connect running, ensure that the version is 1.1.750.0 or later. Azure AD Connect versions 1.1.557.0, 1.1.558.0, 1.1.561.0, and 1.1.614.0 have a problem related to password hash synchronization. If you don't intend to use password hash synchronization in conjunction with Pass-through Authentication, read the Azure AD Connect release notes. Identify one or more additional servers (running Windows Server 2012 R2 or later, with TLS 1.2 enabled) where you can run standalone Authentication Agents. These additional servers are needed to ensure the high availability of requests to sign in. Add the servers to the same Active Directory forest as the users whose passwords you need to validate. In production environments, we recommend that you have a minimum of 3 Authentication Agents running on your tenant. There is a system limit of 40 Authentication Agents per tenant. And as best practice, treat all servers running Authentication Agents as Tier 0 systems (see reference). 8080 (optional) Authentication Agents report their status every ten minutes over port 8080, if port 443 is unavailable. This status is displayed on the Azure AD portal. Port 8080 is not used for user sign-ins. If your firewall enforces rules according to the originating users, open these ports for traffic from Windows services that run as a network service. If your firewall or proxy allows DNS whitelisting, whitelist connections to *.msappproxy.net and *.servicebus.windows.net. If not, allow access to the Azure datacenter IP ranges, which are updated weekly. Your Authentication Agents need access to login.windows.net and login.microsoftonline.com for initial registration. Open your firewall for those URLs as well. For certificate validation, unblock the following URLs: mscrl.microsoft.com:80, crl.microsoft.com:80, ocsp.msocsp.com:80, and www.microsoft.com:80. Since these URLs are used for certificate validation with other Microsoft products you may already have these URLs unblocked. Enable Pass-through Authentication through Azure AD Connect. 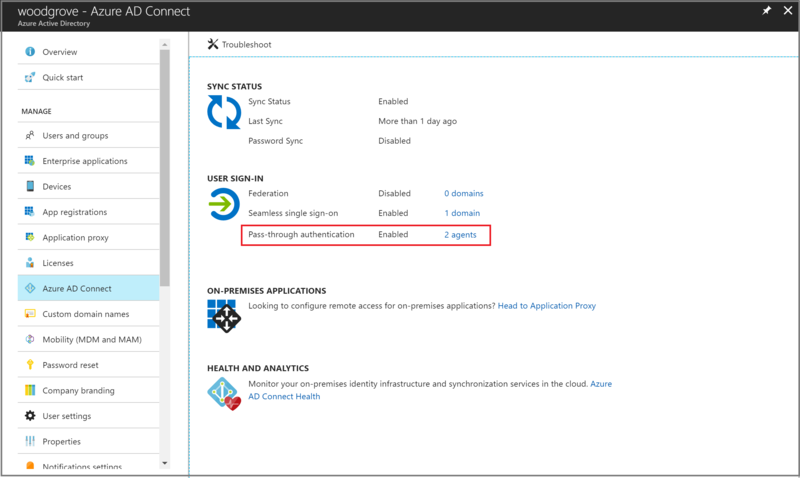 You can enable Pass-through Authentication on the Azure AD Connect primary or staging server. It is highly recommended that you enable it from the primary server. If you are setting up an Azure AD Connect staging server in the future, you must continue to choose Pass-through Authentication as the sign-in option; choosing another option will disable Pass-through Authentication on the tenant and override the setting in the primary server. If you're installing Azure AD Connect for the first time, choose the custom installation path. At the User sign-in page, choose Pass-through Authentication as the Sign On method. On successful completion, a Pass-through Authentication Agent is installed on the same server as Azure AD Connect. In addition, the Pass-through Authentication feature is enabled on your tenant. 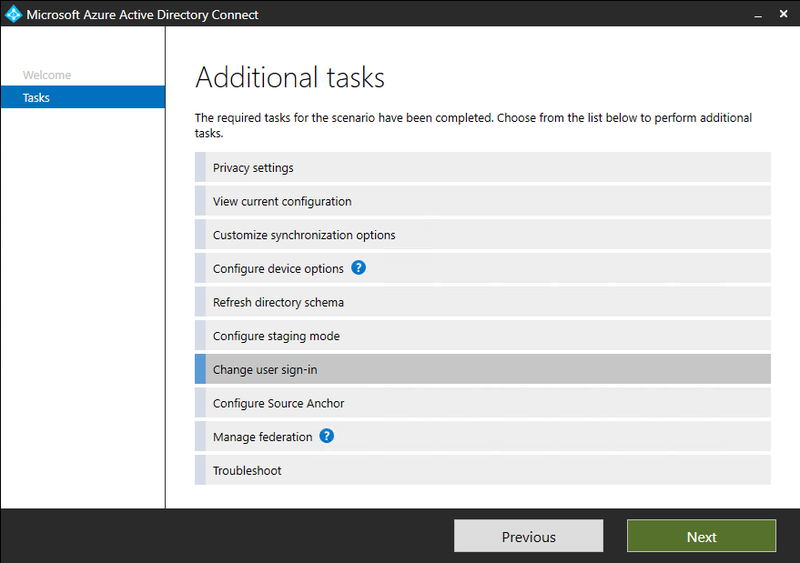 If you have already installed Azure AD Connect by using the express installation or the custom installation path, select the Change user sign-in task on Azure AD Connect, and then select Next. Then select Pass-through Authentication as the sign-in method. On successful completion, a Pass-through Authentication Agent is installed on the same server as Azure AD Connect and the feature is enabled on your tenant. Pass-through Authentication is a tenant-level feature. Turning it on affects the sign-in for users across all the managed domains in your tenant. If you're switching from Active Directory Federation Services (AD FS) to Pass-through Authentication, you should wait at least 12 hours before shutting down your AD FS infrastructure. This wait time is to ensure that users can keep signing in to Exchange ActiveSync during the transition. For more help on migrating from AD FS to Pass-through Authentication, check out our detailed deployment plan published here. 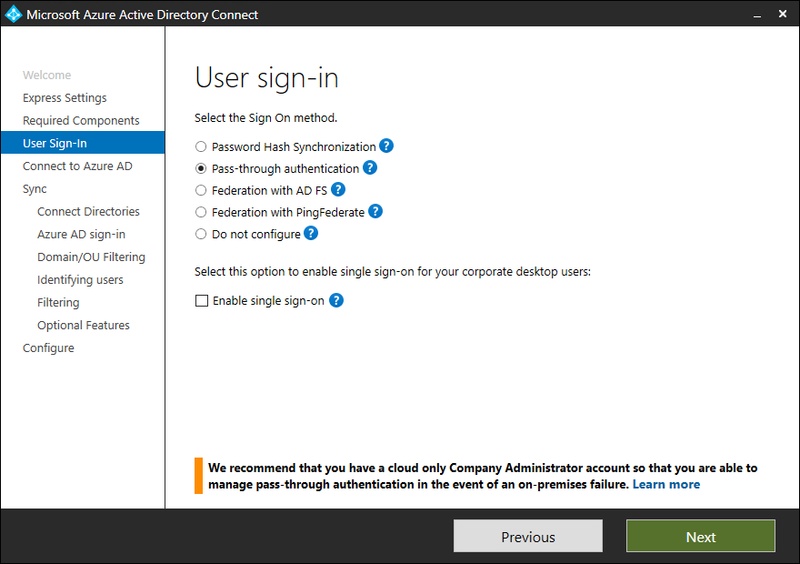 Sign in to the Azure Active Directory admin center with the global administrator credentials for your tenant. Select Azure Active Directory in the left pane. Verify that the Pass-through authentication feature appears as Enabled. Select Pass-through authentication. The Pass-through authentication pane lists the servers where your Authentication Agents are installed. At this stage, users from all the managed domains in your tenant can sign in by using Pass-through Authentication. However, users from federated domains continue to sign in by using AD FS or another federation provider that you have previously configured. If you convert a domain from federated to managed, all users from that domain automatically start signing in by using Pass-through Authentication. The Pass-through Authentication feature does not affect cloud-only users. If you plan to deploy Pass-through Authentication in a production environment, you should install additional standalone Authentication Agents. Install these Authentication Agent(s) on server(s) other than the one running Azure AD Connect. This setup provides you with high availability for user sign-in requests. Installing multiple Pass-through Authentication Agents ensures high availability, but not deterministic load balancing between the Authentication Agents. To determine how many Authentication Agents you need for your tenant, consider the peak and average load of sign-in requests that you expect to see on your tenant. As a benchmark, a single Authentication Agent can handle 300 to 400 authentications per second on a standard 4-core CPU, 16-GB RAM server. Each request has a payload size of (0.5K + 1K * num_of_agents) bytes; i.e., data from Azure AD to the Authentication Agent. Here, "num_of_agents" indicates the number of Authentication Agents registered on your tenant. Each response has a payload size of 1K bytes; i.e., data from the Authentication Agent to Azure AD. For most customers, three Authentication Agents in total are sufficient for high availability and capacity. You should install Authentication Agents close to your domain controllers to improve sign-in latency. To download the latest version of the Authentication Agent (version 1.5.193.0 or later), sign in to the Azure Active Directory admin center with your tenant's global administrator credentials. Select Azure AD Connect, select Pass-through authentication, and then select Download Agent. Select the Accept terms & download button. You can also directly download the Authentication Agent software. Review and accept the Authentication Agent's Terms of Service before installing it. First, you can do it interactively by just running the downloaded Authentication Agent executable and providing your tenant's global administrator credentials when prompted. Run the following command to install an Authentication Agent: AADConnectAuthAgentSetup.exe REGISTERCONNECTOR="false" /q. If an Authentication Agent is installed on a Virtual Machine, you can't clone the Virtual Machine to setup another Authentication Agent. This method is unsupported. Smart Lockout assists in locking out bad actors who are trying to guess your users’ passwords or using brute-force methods to get in. By configuring Smart Lockout settings in Azure AD and / or appropriate lockout settings in on-premises Active Directory, attacks can be filtered out before they reach Active Directory. Read this article to learn more on how to configure Smart Lockout settings on your tenant to protect your user accounts. Migrate from AD FS to Pass-through Authentication - A detailed guide to migrate from AD FS (or other federation technologies) to Pass-through Authentication. Smart Lockout: Learn how to configure the Smart Lockout capability on your tenant to protect user accounts. Current limitations: Learn which scenarios are supported with the Pass-through Authentication and which ones are not. Technical deep dive: Understand how the Pass-through Authentication feature works. Frequently asked questions: Find answers to frequently asked questions. Troubleshoot: Learn how to resolve common problems with the Pass-through Authentication feature. Security deep dive: Get technical information on the Pass-through Authentication feature. Azure AD Seamless SSO: Learn more about this complementary feature. UserVoice: Use the Azure Active Directory Forum to file new feature requests.